I’ve battled depression and all over body/joint pain most of my adult life. “Something is wrong with me,” was my constant mantra. I hadn’t suffered trauma, loss, cancer, divorce or abuse. 95% of the world prays for the life I have. That alone made me more depressed about being depressed because it brought on guilt for even feeling the way I did. I have not confessed to many people about my bouts of depression because sometimes people look at you like you have a mental illness and treat you differently. There are enough “real” problems in the world to think and pray about, I certainly don’t want people worrying about me. I also didn’t want to be sharing my story for a desperate need of attention or to give excuses for why I am the way I am. I’ve only shared with those who have opened their hearts to me because it’s their story, too. And, to my dear closest friends. Doctors said I should be tired and exhausted, I had four children and a job. Tests always looked good, so they’d prescribe me iron, or more potassium, or magnesium, or B vitamins. I’d leave, relieved I wasn’t dying, but never felt healed. Over the last 15 years, I became a student of my own depressed experience. I analyzed every possible cause for to find the root of this despair. Thinking it was physical, I eliminated bad habits of caffeine, coffee, Diet Coke, alcohol and processed foods. I did detoxes and cleanses, exercised regularly, got into nature, conquered addictions and reduced stress. I buried myself in books to learn about my mind – maybe I was crazy and it really was in my mind. I devoured Eckart Tolle, Byron Katie, Penny Pierce, Wayne Dyer, Deepok. I learned all about my ego, consciousness and how we are our thoughts. I did daily devotionals, prayed, vowing to become more spiritual – maybe it was God missing in my life. I thought is was my work, perhaps I wasn’t being true to who I was. So, I began to write, filled art journals, and painted. Of course, I figured it was my marriage – my resentfulness perhaps is what’s taking its toll on me. I sought therapy and tried depression meds, only to find I was in Fog City. St. John’s Wart, the same. Perhaps, it was midlife changes, so I sought out self-help books on mid-life, menopause, had a hysterectomy, and did some serious soul searching. Then the world of energy came into light. I was introduced to Reiki, by my niece, Micara Link, as a way to heal ourselves, so I took classes and learned about how we can heal with energy, focused on releasing blocked chakras and worked on my subconscious blocks buried deep from childhood. She introduced me to clearing, but I guess I wasn’t ready to embrace it just yet. She also affirmed my belief of being a highly sensitive person. This, just a dent in my quest for an answer. I made strides – big ones. But, I was not cured. The Big D kept coming back. Always, it followed me around like lost puppy. I then met Bridgette. Bridgette and I met in a Facebook group of friends brought together by Kelly Ray Robert’s online class, Flying Lessons. Bridgette is a women’s empowerment coach, who also does energy work, intuitive coaching and is psychic. We conversed online, became companions at a writing retreat and I later, continued sessions with her over the phone to receive guidance in reaching my goals and learning about my mind, body, heart and soul and how it all needs to align. I didn’t know then, that she would be the one that would unlock the door to my depression/pain quest. The most powerful gift Bridgette taught me was about energy and how it affects us. I knew some of this, but not to the depths I needed to know. You think you know – but really, you don’t. I learned that I am not just a highly sensitive person, but I am also an empath. Google that. As a HSP (highly sensitive person) and an empath (I know-sounds like a real head case, huh? ), we absorb the energies of others whether we want to or not. I was not only absorbing the energies of any person I was with at the time, I was also absorbing the energies in groups of people, in my surroundings, in meetings, in my entire world. And, carrying it with me, until my body felt heavier, more in pain and more depressed. (I remember learning this with Micara, but I think I was at the surface of just learning about energy then and did not take in more than basic understandings.) This explained my agitation and exhaustion after being at the mall, large group meetings and gatherings and even in my working environment of an elementary school of almost 900 people. I needed help. A game plan. I could not quit my job. 2. Creating a protection barrier around me to protect myself from the energy of others. Bridgette did my first energy clearing for me, over the phone! I was skeptical, but I did believe in energy and the law of attraction. The next day, I felt 20 pounds lighter, had a skip in my step, my depression and pain lifted and I was me again. I honestly FELT “cleared”. A peace and lightness flowed through me. It was a miracle. But, it didn’t last. By the next week, I was back in my bed again, barely able to peel myself away from bed to get to the shower for work. She said I had to learn to do these clearings on my own, and on a regular basis if I was going to survive my job. I found that I needed them twice a week, usually over the weekend to clear from the week and again by Wednesday. I also learned to create a morning ritual for myself before going into my work that consisted of meditation that focused on creating an imaginary protective barrier around me so these energies could not penetrate through my own energy auras. And also, a disconnection ritual at the end of my work day. Yes, it all sounds crazy in a Cosmo-Rica-woo-woo kind of way. But, you know what? It worked. And if something makes me feel better and chases away the pain and depression I suffer, I’m doing it. You know how I know that it was mainly the energies of others that was causing my depression and pain? It’s July 2nd today. We’ve been out of school for one month already. I have not had ONE day of depression or pain and have not had to do an energy clearing or protection meditation since school let out. I’ve been home. Mostly by myself or with my husband. I have never felt better in my entire life. I still abide by everything else I’ve learned to stay depression/fybromyalgia free and healthy. And, I do not believe I would have learned a fraction of all I now understand about our body, mind, heart and soul had it not been for the relief I was seeking. The daily, conscious effort and monitoring of where I am at is a commitment. But, if I want to be of service and help for others, it’s one I refuse to stray from. We are never fully “healed” and more and more is revealed to us every day about who we are, and right now I feel a new knowing that there is something more that I feel called to do. I’m not exactly sure what that is, but I do know part of my purpose is healing, helping and teaching others and I can do that through sharing my story and the workings of our body, mind, heart and soul, along with how energy affects us. Since discovering these newfound paths of healing that work for me, God has guided others my way that need this. Synchronicities has compounded and I am blown away every day. I certainly didn’t think that I would be here sharing with the world my depression journey and teaching others about energy even two years ago. God unfolds for us in a very mysterious way. I just followed the bread crumbs. I’m not exactly sure where the next crumbs will be, but I do know it’s time for me to open up and share with others the understandings, tools, and practices that I’ve been taught to battle depression. If I can even help one person, then I know I’m on the right path. This is a powerful post Shari. I’m so pleased you found what works for you, and that you’re continuing on your journey with an open heart. I absolutely love and agree with that quote by Rachel Remen. May you continue to find out who you truly are. Thank you, Deb, for taking time to visit my writing. I appreciate your feedback and I am hoping by unearthing what I am meant to do, I can help others along the way. You are not alone, Shari. I too am HS and empathic and can totally understand. I have a studio where others are invited to come and stay away. Although, I do not suffer from depression, I have so noticed how others energies have stayed and interfered in my work. I have had personal (myself) and property (my studio space) cleared for many years- I can’ tell you exactly HOW it works but it DOES! Recently, my gal, Colette, did s phone clearing and it sure did get rid of the muck! We do what works! So happy so see you have actually made a sacred space for others. Many people are unable to be alone as they have nowhere to be alone at. What a gift you are, Leslie. Thank you for commenting, Christa. And, sometimes it’s our husbands who have the hardest time understanding us. I think, in their minds, they maybe think they never will?? haha! Shari thank you for sharing this powerful post I understand the empath as I know I am one too. If I sit too close to people I can feel a certain vibe and sometimes I come away exhausted if someone is ill or down. We are after all made up of energy. I lost my brother to depression so I know we should never trivialise this condition and I have experienced depression after he died. We need to talk about it and writing about your own experiences will help others. There are many. Thank you for sharing such an important part of you and I am glad you found a balance. Goodness, Kath. My heart aches for you and the loss of your brother. Depression is an illness that touches so many. It’s a daily battle of which has no specific cure, but through the sharing and compassion of others, just knowing we are not alone is medicine in itself. I agree Shari and it needs a BIG voice to shine a light on the possibilities of positive ways to show people that we are not alone. That in itself may have helped my brother, but he hid it very well. My heart breaks every time I hear about another person who loses this battle. Shari, you are so courageous, and your writing is so beautiful. Thanks for sharing so honestly with us. This is a powerful and moving story which needs to be told, and will help so many. I look forward to hearing more of your journey in the coming months. And keep going. Keep being brave. The world needs to hear your words. I have so much admiration for you Shari. Thank you, James. It’s a scary trip, but I feel so much clearer at this point in my life and hopefully will be able to navigate my way without being so afraid. I appreciate your kind words. What a courageous journey…..and thank you for sharing some great insights. Powerful, powerful post. It needs to be shared Shari. I’ll share it all I can. This kind of healing is like following a path of crumbs…& sometimes the crumbs disappear. It does seem like an odd road to follow at times, but is so very necessary. Before I found out about being empathic, I had times of thinking I was losing my mind or becoming agoraphobic. The epiphanies along the way will never be forgotten…. I am so glad you are writing them down & sharing! More crumbs to make the path clearer for those who follow. Now anytime I begin to wonder why I feel a certain way ( anything negative) I am giddy to realize “I don’t!” & go about releasing those feelings & becoming more conscious of that self protection in the first place. It is truly a joy to climb out of the pit (it felt like) of others fears, angers, jealousies & gain the perspective you have honed for yourself. Blessings to you in your continued journey & the help you are sharing with others. I feel like people who are highly sensitive and empathetic need to do so much inner work to help us understand why we are the way we are. It can honestly seem obsessive. Writing and sharing this work allows me to feel like I’m becoming to self- indulgent. We have to participate in improvement of more than just ourselves – when we do come out of that pit. I’m almost lost for words. Your journey is touching mine in so many ways and I’m so grateful that you shared. When society is trying to conform us into something uniform the road to being healthy can be full of hurdles. Realizing that I’m an HSP, empath and and extremely sensitive to other people’s energies was the way for me to find the tools for living with depression and anxiety. Meditation, yoga and mindful living are what I need to stay on track. And a lot of alone time. Very curious about the energy cleansing techniques you learnt. Thanks again for sharing so openly and honestly. It just amazes me how many of us share the same journey – I am actually grateful for this, because we recognize how we are not alone and that in itself is so comforting. I plan on writing more about some of the energy practices I use, as well as writing about the mind, body, heart and soul and how each aspect of our being also plays into that depressive state. I’m not a doctor, psychologist, energy practitioner, or any sort. I’m only an expert of my own experience and I hope that can help even one person. There is so much to learn about ourselves with these traits that we carry. I wish I’d have understood them when I was a child, or as a teenager, but then, I would not have learned all that I have. I hope that you find more relief for your fibro pain. Please share what else you find to combat it – or if it just takes more time and energy work. I’d love to hear about it! I am also an HSP, introvert, and an empath with a history of three major depressive episodes. How happy I am to read about your journey with energy work. I love what you’ve shared here. Sometimes I forget what it was like to feel so helpless and down since it was over 14 years ago for me. I’m drawn to learn about this more and more because of reading this, so blessings and thanks to you! Thank you for taking time to read a piece of my journey, Naomi. And, it is a journey. Always, something new throws us a curve and causes us to search for some more tools for our toolbox. I’d love to hear about your story. Being you share so many of the same characteristics as I do, what practices did you find were successful in pulling you our of those depression days 14 years ago? Your story is so interesting and well written, Shari. I applaud you for wanting to share it with the world. Thank you so much for taking time to visit my writing, Joan. Clearing is a powerful tool and I’m not sure there are many people that really realize how detrimental other peoples energy can have an affect on our bodies and minds. Wonderful article. What a great post, Shari. Depression comes in all shades, doesn’t it? It’s a good to be able to slowly get out of the grey area and start seeing the color your life is supposed to be. Blessings to you! Thank you so much for taking time to read my words. 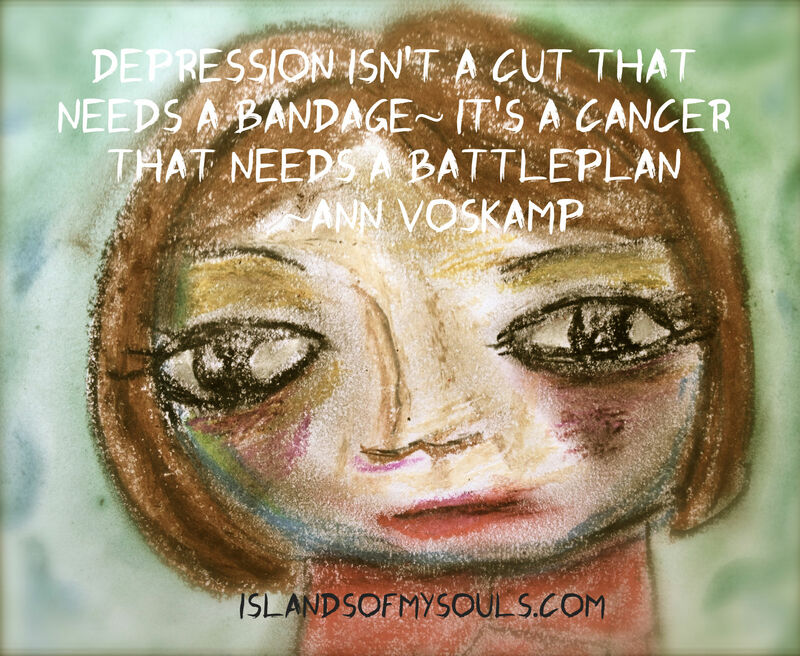 And, yes, you are right ~ depression is such a trick. For sensitives, who are so much more prone to depression, it’s so important to understand all the the places it can come from. The blessing is that by examining all these possibilities, we learn to know ourselves very well. I found your post really interesting. I too am a HSP and based on my reading probably an Empath. Thank you for your transparency and your desire to help others recognize things about themselves that can help not only them, but also the people in their lives. Hi Shari, Thank you for being so brave and writing this post … for sharing so much. Bridgette is completely amazing, isn’t she? I love her. Being an HSP changes our world and being an empath just compounds it even more (can completely, completely relate). The amazing thing is – the empowering thing – is learning about our personal energy flows so that we can learn to use them. In some ways, maybe we’re lucky. We get this internal indicator that forces us to – hopefully – take better, more gentle, care of ourselves so we can put our best selves out in the world and serve it in the way we’re meant to. Thank you again for sharing. Sending you so much love.